My theme for the first three weeks in November is World War One. The Great War was politically far more interesting than world war two and every bit as terrible a war, yet the atrocities of war two is far more publicised. Even resource wise for teaching, I found so much information on-line about world war two and not half as much on world war one. 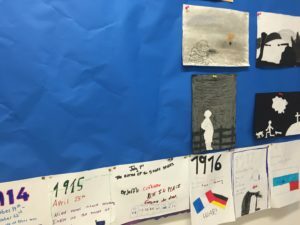 Eras of change and conflict- world war one. This is my second week on this topic,so I shall explain first what I taught last week, and then what I intend to teach this week. Each child chose a date to write about and illustrate. 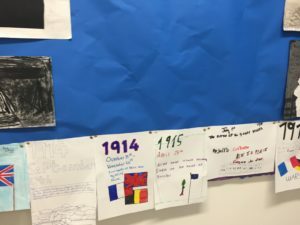 I showed the children a simple power-point presentation of world war one and we discussed it. We are reading ‘Private Peaceful’ at the moment which is about war, so that ties in nicely. We are practicing using descriptive writing in English. 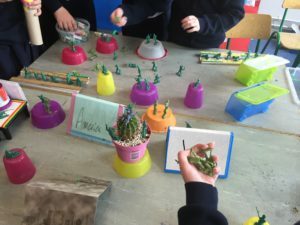 We wrote war stories based on out time in the trenches from a soldier’s point of view. We brainstormed to discuss what the soldiers could see, hear, smell, taste, and how they felt. The children wrote really poignant stories. 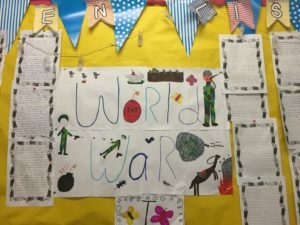 Poetry: The children wrote their own stories based on the war. I will put their poems up on the class website tomorrow to show you. They were again, quite good. The children really seemed to get into the mindset of the soldiers in the trenches. It must be from my tendency to be dramatic with my story telling! SPHE: We explored the term shell shock and how the soldiers were affected by the war, and how they lived their lives after the war. 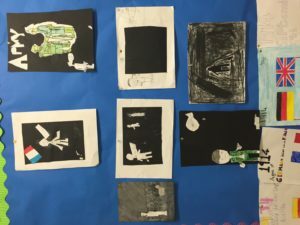 Art: We made these haunting silhouettes of soldiers. 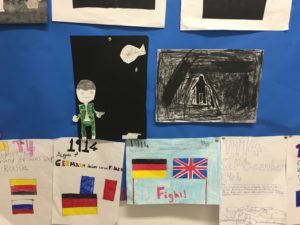 Each piece of art had to tell a war story. 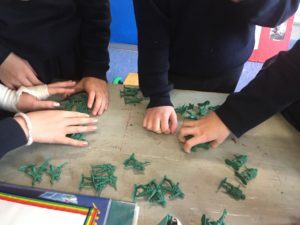 History: We learned about the allies and central powers through using toy soldiers. We spoke first about the countries involved in the war, which sides they were on, which countries were the most powerful, who were the leaders of the countries and so on. After talking about this, I put the children into four groups. We had two countries on each side, the allies and central powers. The children had to organise their soldiers first into commanders, foot soldiers, snipers etc. They then set up their trenches and base camps. After this they had to form their plan of attack and start training. We had one or two spies who became prisoners of war but besides that it was okay! We were just having the final battle when it was suddenly home time, so we will resume tomorrow. In poetry this week we will study the poetry of Siegfried Sassoon. Science: Yet to decide as it is Science Week too! English : We will continue reading our novel and we will write letters and diary entries from soldiers. History 2: We will learn about the lives of children during world war one. 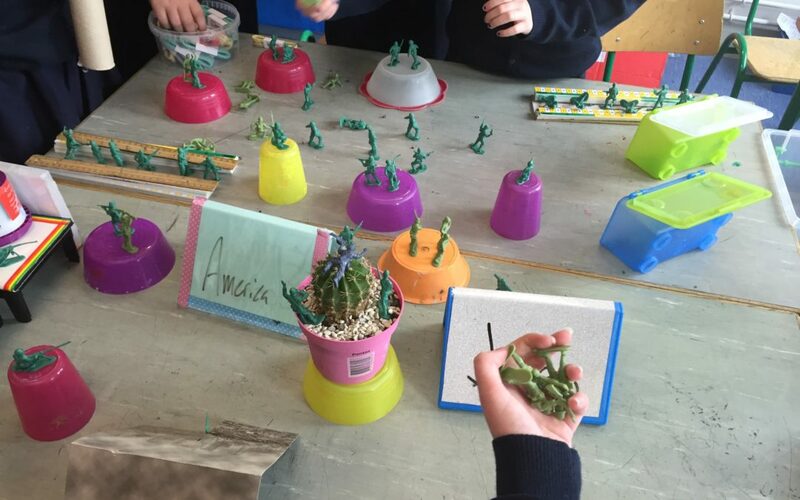 Art: We will make dioramas of war scenes. I haven’t decided on the rest of the subjects yet! Hope this helps any of you teaching about WW1 this week!